Truck Routes – Disappointing, not surprising. Posted on July 28, 2014 February 6, 2015 . by Patrick Johnstone. 1 Comment. I suppose the refusal by TransLink to remove various New Westminster streets from the designated truck route network is not surprising, but the wholesale dismissal of the concerns with a paucity of supporting arguments is definitely a disappointment. I hope this is not the end of this discussion, but the beginning of a conversation about the specific routes, and just a small setback to eventual progress*. I don’t think anyone really thought Royal Ave would be removed from the designated routes at this time, not at least until there is a significant change in how the Pattullo Bridge connects on the north side of the River. 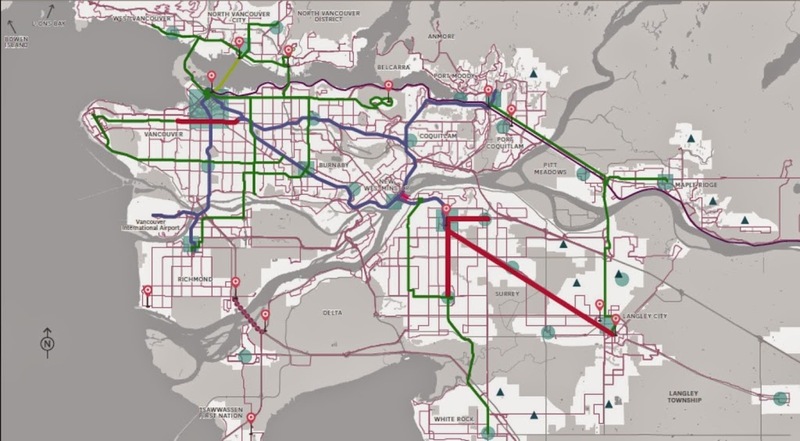 However, there is no reason for keeping East Columbia through the Sapperton business area as a truck route, and a re-evaluation of the East 8th Ave connections are definitely in order. Part of the frustration is the TransLink news release itself. 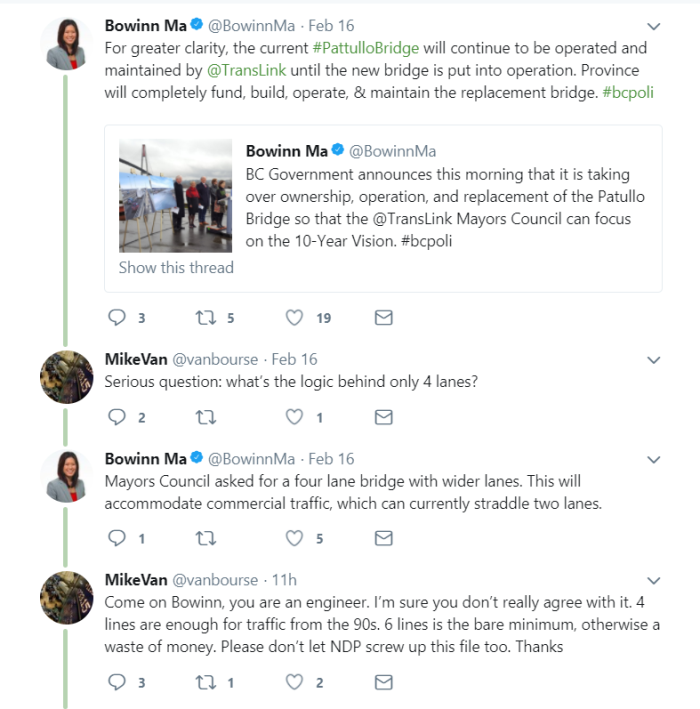 Apparently released to a few news outlets, there is nothing on the TransLink media page, and the reasoning behind the decision is not made clear. 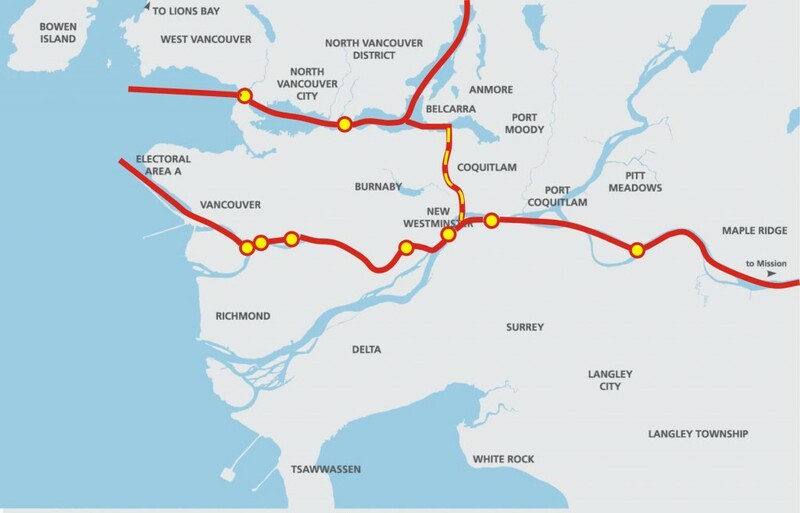 The City of New Westminster provided rationale, alternate routing proposals, and justifications, and TransLink essentially said “no” without addressing the specific points. 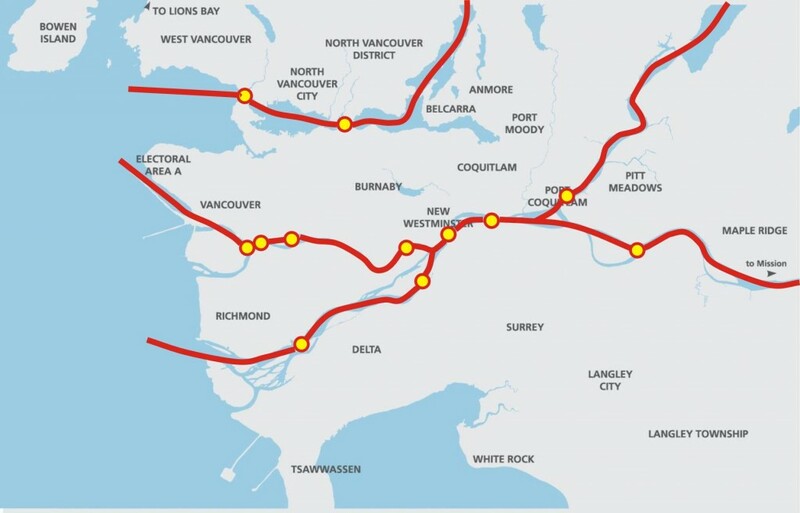 Of course, they “took feedback from… Port Metro Vancouver, BC Trucking Association, and the Greater Vancouver Gateway Council” – that last agency essentially being the marriage of Port Metro Vancouver and the BC Trucking Association. It is unclear of they consulted with any of the residents being impacted by these trucks, by the PACs of the impacted schools, or by the businesses in Sapperton or elsewhere in the City that are meant to be serviced by these trucks. Nor are they reporting out on the feedback they received. They basically asked kids if they want ice cream or Brussels sprouts, and got the predictable answer. On the positive side, there is language in the news story about working with the impacted neighbourhoods to find solutions, so let’s hope this dismissing the proposed solution out of hand doesn’t set the City back too far, and we can start an expanded conversation about accommodating goods movement while protecting the livability of our City. “No” isn’t an answer I want from any level of Government. I would rather hear: “That solution doesn’t work, but lets find one that does”. There is an ongoing Facebook conversation about this topic in the Group “Rattled About Traffic In New West” with a variety of voices piping in, some more rational than others. The voice I find most interesting is that of Dave Tate, who is both a trucker, and cognizant of the impacts truckers have on neighbourhoods. He has been promoting the idea that a weight restriction on the Pattullo would increase safety, prolong the life of the bridge, and would remove much of the heaviest cohort of the truck traffic from Royal- those triple-axle container trucks that are typically the ones that rattle and bang down Royal, have the biggest impact on road wear and traffic, are typically the worst performers in the random roadside safety inspections, and are most likely to be using the Pattullo as the “toll free alternative” between two points that could easily be connected by an alternate route. It is good to hear from a balanced group of people on this issue, as it is refreshing compared to the comments one might hear on the AM radio call-in shows. Yes, I’m looking at you Simi Sara. If a significant proportion of the several hundred thousand cars that pass through New Westminster every day actually stopped to shop here, this would indeed be a strong argument to use, but unfortunately, this is just not the case. In actuality, it is the massive number of through-commuters and heavy truck traffic that makes it harder for people from around the region (and our own residents!) to access our business storefronts. It also makes our retail areas less attractive to spend time wandering around in. Removing trucks from East Columbia would improve, not worsen, conditions for businesses in Sapperton. Admittedly, New West does have a resounding number of Save-on-Foods outlets, but I doubt they require the 3,500 trucks a day crossing the Pattullo, with similar numbers coming in from Brunette and across the Queensborough to keep the lettuce shelves stocked. Besides, these truck route changes would not impact at all local delivery or pick-up of goods, because trucks are permitted on non-truck-route roads when actually having business on that road.These closures would only effect through-traffic trucks with no business in New Westminster, the ones that we just spent $5 Billion on new bridges and highways to accommodate. Problem is, there is no perimeter, unless you define perimeter as “where someone else lives”. The roads at the perimeter of our City run right through the heart (and other vital organs) of our community, and right past people’s homes. 10th Ave is residential west of Kingsway, and residential and way too steep for trucks east of McBride. 8th Ave is residential most of it’s length. Columbia is both residential and home to a lot of ground-based retail, and is the heart of two of our most historic neighbourhoods. One can argue Brunette is a perimeter, but it only connects to non-perimeter roads to the west. Front Street cuts through our resurgent waterfront area – downtown will only succeed if Front Street succeeds as human space that connects downtown to the River. McBride, Royal, 12th Street, 8th Street – these are urban streets in the middle of bustling neighbourhoods surrounded with parks, residences, and commercial districts. Where is this mythical “perimeter” where you want to put all the trucks? The short answer to the rhetorical question: fewer than any neighbouring community. 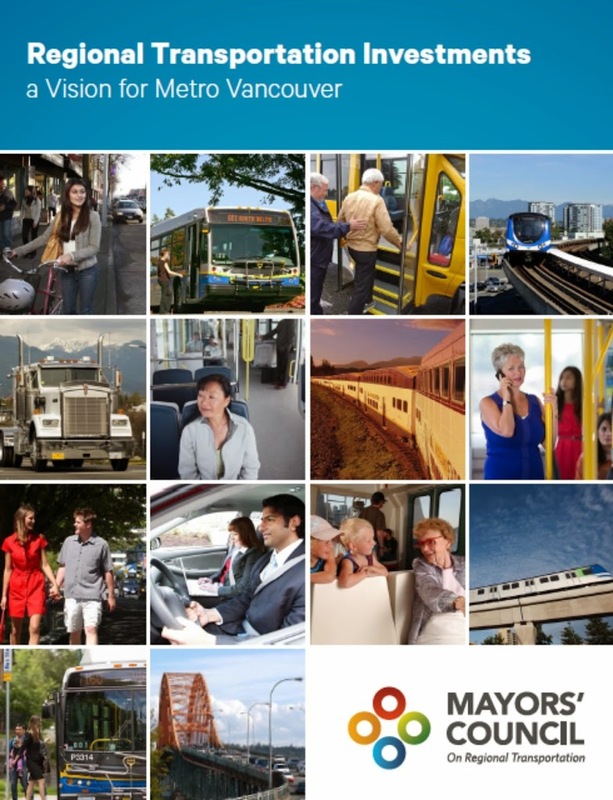 New Westminstergenerates fewer car trips per capita than any Municipality in Metro Vancouver excepting Vancouverproper. Our “alternative mode share” (people who use their feet or transit for their daily commute instead of their car) is the second highest in the region. 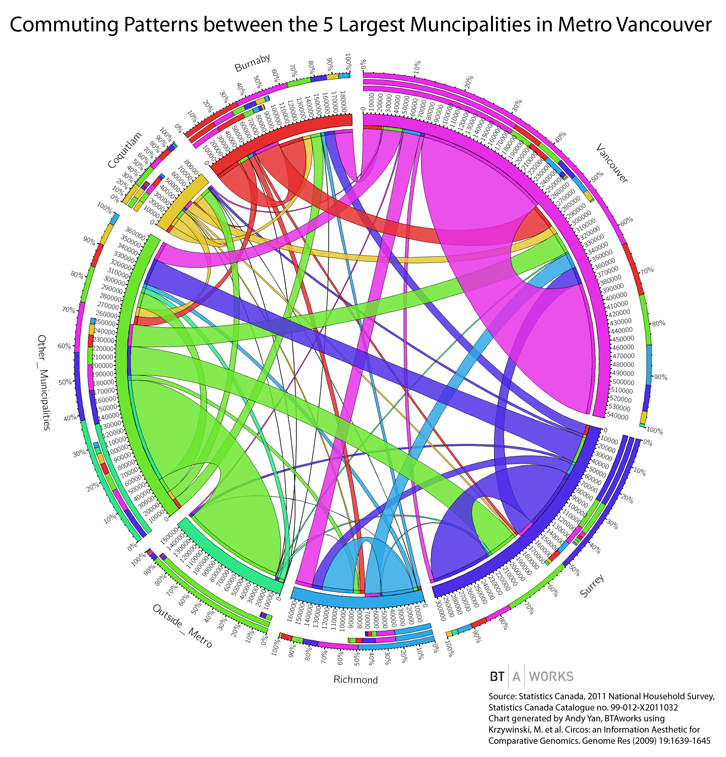 If the Northeast Sector (~82% of trips in a car) and South of Fraser region (~82% of trips by car) [data available here] had New Westminster’s mode share (~65% of trips by car) or took steps towards reaching the goal New Westminster is reaching for in the new Master Transportation Plan (~50% of trips by car), that would be a huge step towards addressing the traffic problems in New West, and a huge step forward for the region and the Province. 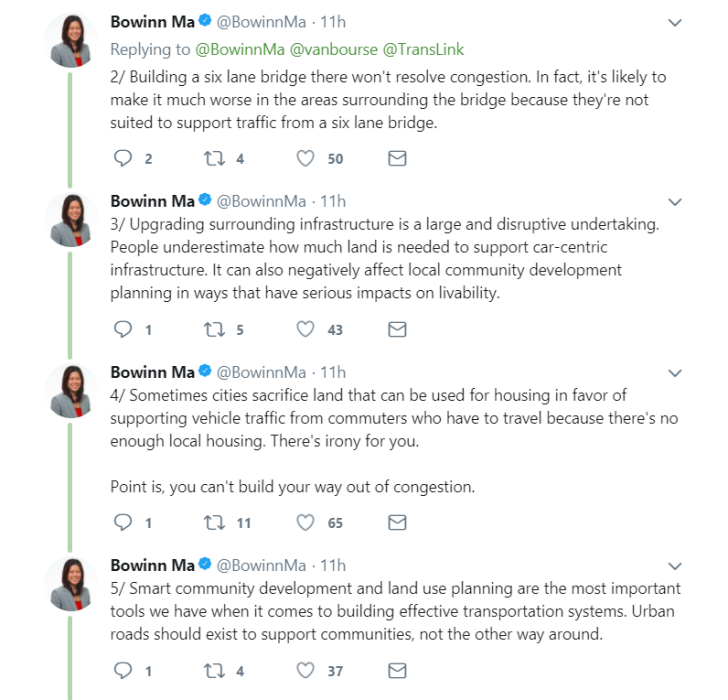 This all brings me to the real point here: New Westminster is not the selfish, parochial, progress-impeding “speed bump” in the regional transportation system and we need desperately to get past that narrative. 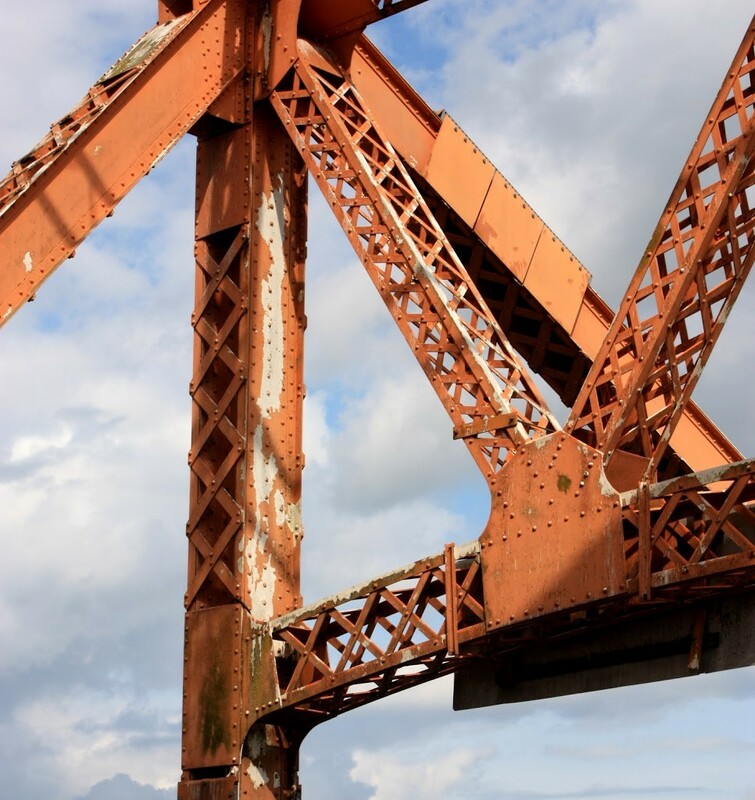 New Westminster is a leader in moving towards meeting its regional commitments to a more sustainable transportation network. 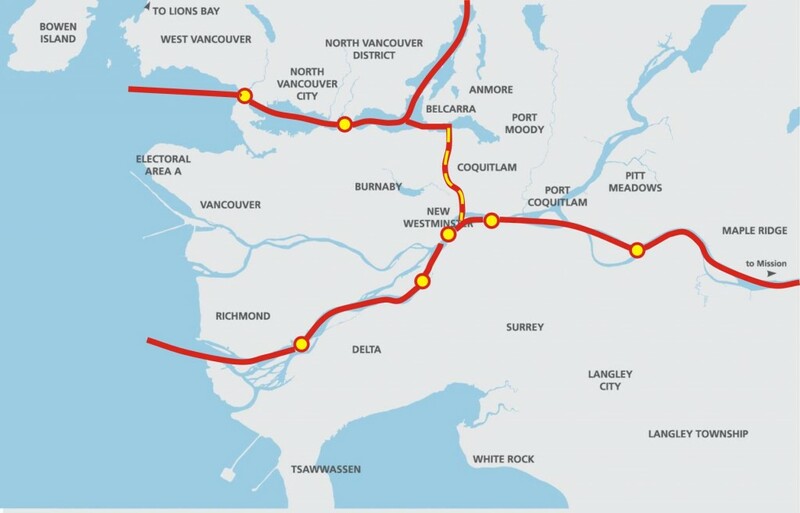 It has lead by building a more compact City, investing in mixed-use developments near transit hubs, but taking a SkyTrain station that Coquitlam refused, and by holding the line on mega-freeway development while suggesting increased transit investment might be preferable if the region hopes to meet its Sustainable Region goals. New Westminster has been demonstrating transportation leadership, both in words and in action, and we should not be shy talking about it. *Since someone asked: Progress, by my definition, is moving towards an efficient transportation system that serves the community, not a community that serves the least efficient transportation systems. 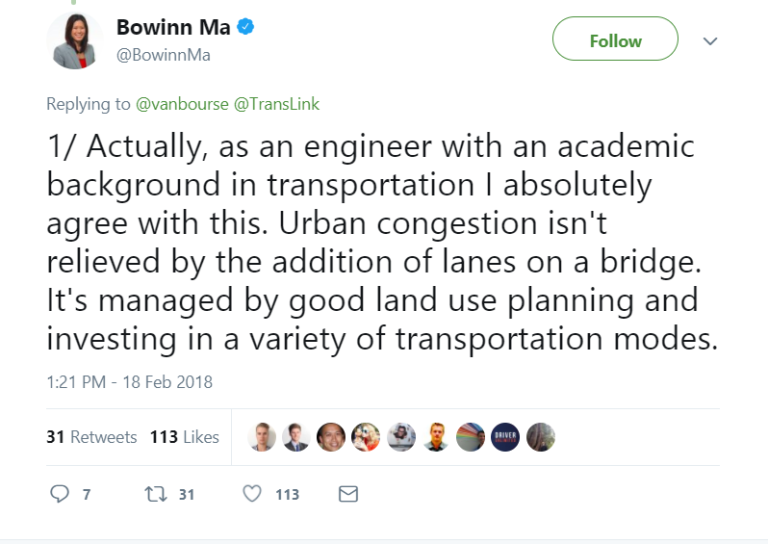 “Building more lanes” has not represented progress in traffic management circles since the late 1970s; where providing affordable, efficient alternatives is how the 21st Century sees progress in Transportation planning.